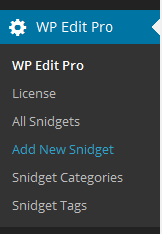 A WP Edit Pro Snidget is a cross between a snippet and a widget. They are versatile, powerful and extremely easy to use and administer. Without a doubt, the WP Edit Pro Snidget feature will become any publishers best friend. The first step is to enable the WP Edit Pro Snidgets. 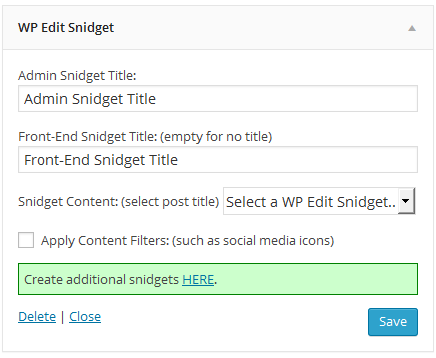 Click the “Snidgets” tab from the WP Edit Pro admin panel, and check the box to enable snidgets. Once snidgets are created; they will be listed on the WP Edit Pro Snidgets tab; providing quick visual access to edit or delete snidgets. The next step is to create a snidget. A snidget is just like any other post. WordPress calls these “Custom Post Types”. They are visual duplicates of the standard post creator; and allows developers to add… well… custom post types. Let’s hover over the WP Edit Pro admin menu item; and select the “Add New Snidget” option. 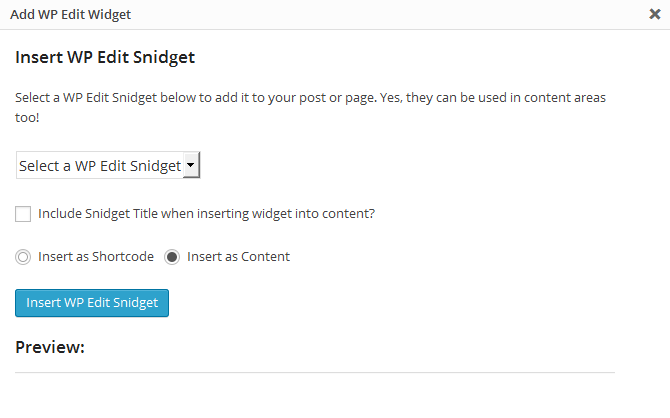 The snidget editor very closely resembles the default WordPress post content editor. With the exception of a few metabox changes; the editor is a visual duplicate. We can enter any type of content into a snidget: text, images, videos, and any other content added by plugins or themes available in the content editor. In the screenshot below, I have created a simple table. However, the complexity of a Snidget is only limited by ones imagination. Now that we have created a snidget (go back to the WP Edit Pro Snidgets admin page; and see your new snidget table), it can be inserted into a WordPress post or page; or a widget area. Open any post or page in the admin panel. Immediately above the content editor, next to the “Add media” button, is a new button titled “Add Snidget”. Clicking the “Add Snidget” button above the content editor in any post/page will open the following window. Select Snidget This select box lists all available snidgets, by title. Selecting a snidget will display a preview of the snidget content. Snidget Title Check if the title of the snidget should also be inserted. Insert Choose to insert snidget as a shortcode, or as content. It is important to decide how to insert the snidget. The options allow for inserting as a shortcode, or inserting as content. Each method has pros and cons. The advantage of inserting snidgets as shortcodes is if it’s required to modify/update a snidget; you can do it once from the snidget admin area. Then, the change will filter down to all posts/pages that have used the snidget. The disadvantage comes when/if you deactivate WP Edit Pro. Any snidgets inserted as shortcodes will appear as ‘broken’ shortcodes; and the content of the snidget will not be rendered properly. The advantage here is when/if you deactivate WP Edit Pro; all snidgets will still appear properly. Since they were inserted as HTML, they will still display correctly even if the plugin is deactivated. The disadvantage comes when a change/modification is needed to a snidget. If they were inserted as content; then it will be necessary to revisit every single post/pag where the snidget was inserted, and update the html. Once options are selected, click the “Insert WP Edit Snidget” button. You will see your options added to the content editor, at the current cursor location. A snidget can also be added to any widget area. When we enabled snidgets back at the very beginning of this article, we also enabled a new widget titled “WP Edit Snidget”. From the admin panel, click Appearance -> Widgets. The new snidget widget (haha), can be found along with the other available widgets. Admin Snidget Title Set the title of the snidget, as it displays in the admin widget title area. Front-end Snidget Title Set the title of the snidget as it appears on the website. Snidget Content Select the snidget which should be displayed (by snidget title). Content Filters This will filter out any html added automatically by other plugins; such as social media icons. Save the Snidget; and it will be visible on the website in the applicable widget area. Have you found another application for Snidgets? I would love to hear from you. Use the comment form below to share your experience. This entry was posted in Snidgets. Just looking at these snidgets for the first time… seem like a handy idea. Seems that it might be handy to be able to give the snidget div a custom class so that you can style it – is there a way to do that? Hi, and thanks for posting. Yes, Snidgets have a custom class added so targeted styling can be applied. But seriously, I’ve downloaded the free version and it looks very good to me. I have been using Black Studio TinyMCE widget to get functionality of post style editing for widgets, but it is not ideal. WP-Edit Pro looks better for this purpose, plus you get a whole lot more besides. I have a question though! Do I have to uninstall TinyMCE Advanced before upgrading to the Pro version? I don’t recommend using TinyMCE Advanced with WP Edit (free or pro). This is because we both use the same WordPress editor hooks and filters to run various functions. Both running together can sometimes cause performance issues. If you notice any functionality lacking in WP Edit Pro; please let me know. User suggestions are often the best forms of plugin updates. Thanks Alan; I appreciate the support! If I were to add a widget then access the widget snidget area beside the other widgets that were not quite snidgets, would that mean I could use the aforementioned widget snidget and place beside the snidget widget in the widget area next to the widgets that were not 100% snidgets? If I understand correctly; you’re wanting your page to output a widget, then a snidget, then another widget (or any combination thereof)? Yes. In your WP admin panel (widget area); you would add a snidget just like any other widget. It can be dragged to any of your themes available widget areas. Once added; it will appear in whatever order the widgets are set in the admin area. You can adjust it’s order by dragging the snidget/widget above/below other normal widgets. Hi Josh – Is the snidget shortcode broken if WP Edit Pro is deactivated temporarily, say to determine if it’s the cause of another plugin problem, then reactivated? Or only if the program is removed permanently? Well, it depends. If the snidget is inserted as a shortcode; then yes, it will appear broken when the plugin is deactivated. When the plugin is reactivated; the snidget shortcode will render properly again. If the snidget is inserted as content… then it will always render properly… regardless if the plugin is active or not. It took me a while to get my head around the idea of snidgets. I now see so many uses for them. They are fantastic. Thanks Josh! Thank you very much. Sorry it took me a while to reply.